This has been a thrilling week for Star Wars fans as we just got to experience a brand new Star Wars film, Rogue One: A Star Wars Story. The film introduced many new amazing things to us, but also featured many welcomed callbacks and references to other parts of the saga. Star Wars: The Clone Wars and Star Wars Rebels were heavily referenced in Rogue One, and now one of those shows is about to return the favor. Our friends at Making Star Wars have alerted us to something the Rebels Reactions Podcast found regarding a major Rogue One character that will be appearing in Rebels. What they found is a Star Wars Rebels poster that's being given out at a Toys"R"Us. 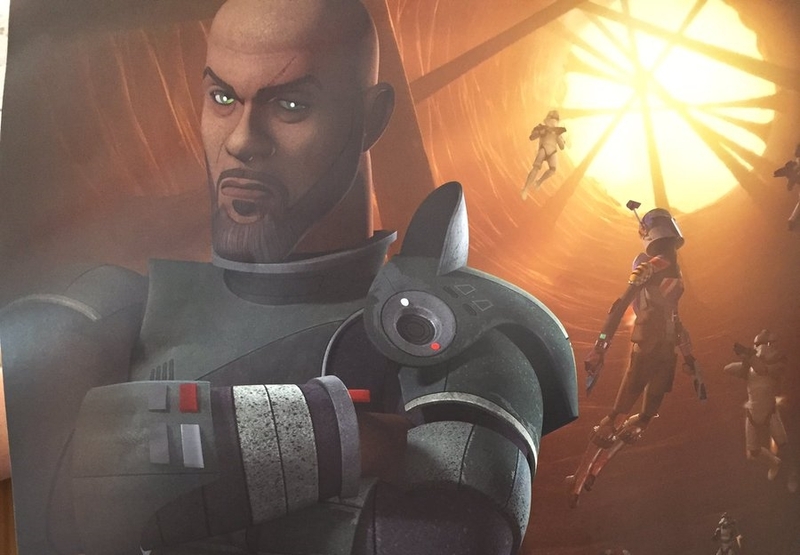 The poster shows the Ghost crew in the shadow of none other than Saw Gerrera! Saw appears bald in the poster, which matches his look at the begining of Rogue One. No further information about Saw's appearance is know at this time, but an official announcement is surely forthcoming. It should be noted that the planet near the bottom looks to be Geonosis, which could mean Saw will appear in the hour-long midseason premiere "Ghosts of Geonosis", airing January 7th. If you look at the timeline on pg. 81 of the Rogue One Ultimate Visual Guide, it says Saw "leads mission to investigate Geonosis" 2 years before Rogue One. I think "Ghosts of Geonosis" will more than likely center around this mission. Pretty cool tie-in.